To see our complete lineup of FAA written/knowledge test prep products for iPhone™/iPad™, Click here. Our iPhone™/iPad™ test preps for Military Comptetence Airplane (MCA), Military Competence Helicopter (MCH), and Military Competence Instructor (MCI) that will allow you to convert your miliary flight experience into civilian certificates and ratings are included as part of our overall "FAA Commercial Pilot" and "FAA Flight and Ground Instructor" test prep apps, respectively. 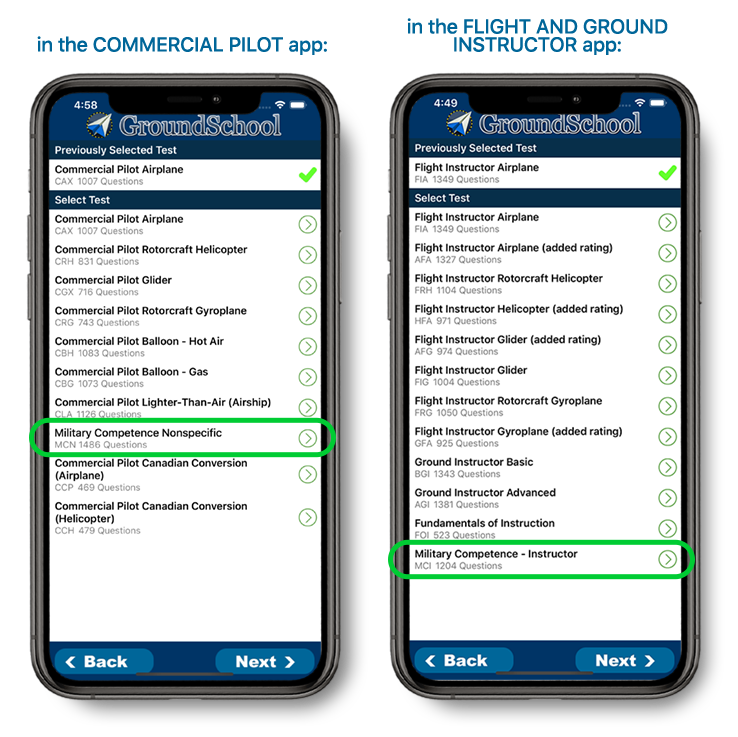 Specifically, the MCA and MCH test preps are part of the commercial pilot app and the MCI prep is part of the Flight/Ground Instructor App. 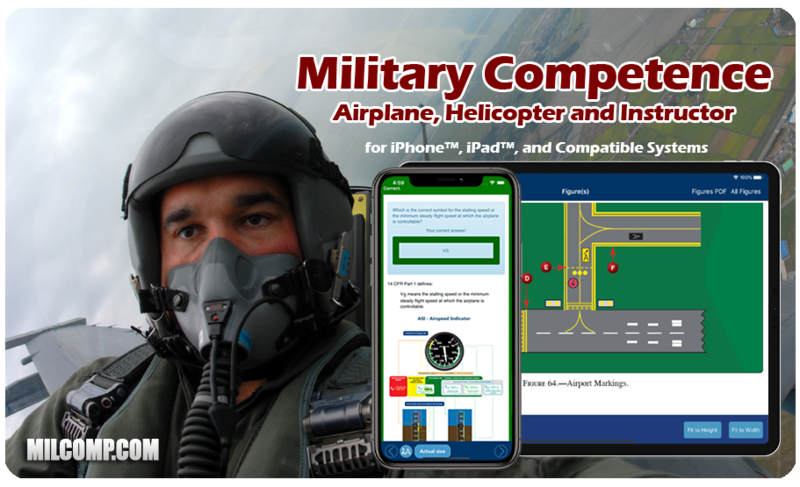 After you purchase the app and run it on your device, it will ask you which test you want to study for - simply select MCA, MCH, and MCI as appropriate (they will be included along with several purely civilian tests in each app). This is a great way to prepare for your military to civilian conversion test wherever you are with your iOS™ device. You can click on one of the links above to get more info about one of the two relevant apps here or to purchae it directly via the iTunes™ AppStore™. All FAA questions just like our FAA GroundSchool software has. Not some measely pared-down question set - you get the full thing complete with our detailed, illustrated explanations, allowing you to do all of your FAA knowledge test prep study right on your iPhone. Integrated Upgrades - get upgrades right into your iPhone from our servers. So, when our editors change things, you get access to the latest and greatest quickly. This is REALLY IMPORTANT and we're the only ones that we know of that have this feature.